Traditional engine drive trash pumps are ideal for pumping applications in environments where supplying power for an electric pump is not practical. Trash pumps come in two options – a wet prime pump where water is added to the pump chamber to prime the unit, and a dry prime pump, which uses a vacuum pump or compressor to assist with priming. Simplicity is a major advantage in wet prime trash pumps; unlike dry prime pumps, they don’t require complicated priming apparatus in the form of complex compressors or vacuum pump systems. Conventional dry prime pumps use an induction style system not designed for trash handling. Additionally, wet prime trash pumps are easy to set up, use and maintain. With fewer moving parts, they also deliver reliable performance. “Dry prime pumps have the ability to ‘snore’. That means they will automatically reprime as the water level varies,” said Aussie Pumps’ Product Manager, Brad Farrugia. “However, for straightforward water transfer or dewatering a flooded construction site, a simple wet prime pump is a more cost effective option,” he said. To transfer typical construction site water, industry experts recommend heavy-duty trash pumps capable of handling silt and sand laden water without ‘choking’. 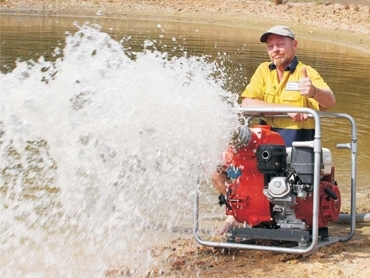 Australian Pump Industries offers a complete range of trash pumps from 2”-6” in ‘Mine Boss’ configurations. These pumps come designed for tough work at construction sites. Key features of Aussie’s Mine Boss range of trash pumps include super heavy-duty 38mm fully galvanised frames with lifting bars and E-stops, battery isolation, and optional bunded trays or even wheel kits; lifting bar at the point of perfect balance designed into the frame to enable the unit to be moved easily by crane or excavator on site where necessary; big open ‘non-clog’ style impellers handling solids in suspension; ability to handle solids-laden liquids such as flood water, slurry, and even effluent with solid concentrations up to 25% of the liquid volume; and flows of up to 6,000 lpm and heads as high as 47 metres. The self-priming range offers a vertical lift of 7.6 metres with no requirement for mechanical priming aids. “A lot of contractors use dry prime pumps for site dewatering because they don’t understand how simple the wet prime principle is,” said Farrugia. Self-priming or wet prime pumps simply require the pump cavity to be filled prior to starting for the first time. The pump will subsequently self-prime as long as there is water above the impeller. An internal check valve ensures the prime is held once the pump stops. “Trash pumps have lower investment and maintenance costs compared to vacuum primed pumps,” said Farrugia. Wet prime pumps can last 20-30 years with regular maintenance. Further information on Aussie’s wet prime transfer pumps and free copies of the Aussie Pump Smart Guide are available from Australian Pump Industries.